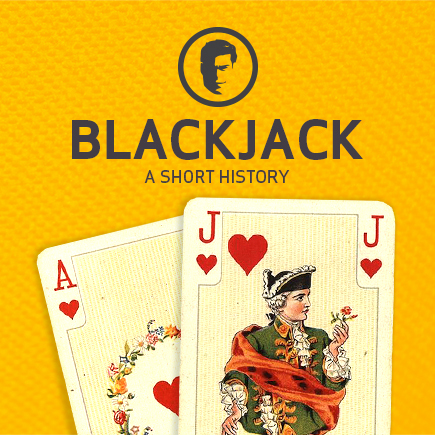 The history of Blackjack is one filled with speculation and assumptions, and continues to be debated by gambling fanatics and historians worldwide to this day. Whilst there are no certainties regarding the background of Blackjack, most experts agree that it most likely originated in French casinos in approximately 1700. During these early stages, the game was called Ving-et-Un, French for 21. The general consensus is that the game originated from the French card game Chemin de Fer (which translates to Way of the Iron due to the cards being kept in an iron container) and a Spanish card game ­called One and Thirty in which the player tries to collect no more than 3 cards, valuing 31 points, without busting. An additional theory is that the gambling loving Romans were the originators of this mysterious table game, and that they played it with numerically marked wooden blocks instead of cards. Whichever hypothesis of the origin is correct, we’re certain that by the early 1800s these early forms of 21 had made their way to the United States, and by 1931 (when gambling was legalised in the state of Nevada) Blackjack, as it was now known, was one of the most popular table games at all casinos. The name Blackjack came from an early (and now defunct) rule that gave players 10-to-1 odds if they had a hand featuring, yes you guessed it – a black Jack (any Jack that is a spade or club). With no exact definitive creation date or specific inventor, Blackjack’s background remains equally as mysterious as the game is exhilarating to play. This standard, most well-known version of the game has now become pretty consistent worldwide, although the online casino industry continues to develop variations to keep players entertained. Find your favourite version and join the online casino Blackjack phenomenon today.